The Swift Escape 664 is four berth Motorhome which is ideal for a couple looking for a motorhome large enough at 6.7 metres long, for all the home comforts but also small enough to manage, whilst it is advertised as a four berth in our opinion its really a very comfortable two berth with the availability on occasions to accommodate up to two children. Grade 3 insulation classification for sub-zero temperatures. Fitted with 2.3 litre turbo diesel engine with a 6-speed gearbox giving ample power for any situation, being a low-profile model, this motorhome will do around 30 to 34 miles to the gallon. The drivers and passenger cab seats in the Escape 664 swivel round giving extra space by using the cab area. There is a good-sized telescopic table with a sliding function to add extra size, as its not intrusive we usually leave it in place, the two front facing rear seats are fitted with seat belts. 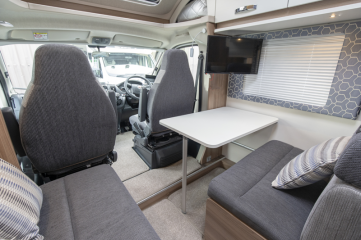 There is ample storage with overhead lockers and an area under the bench seat, removable carpets are available throughout the van. a large opening sunroof allows ample sunlight in to the lounge, Pleated front windscreen blinds, cassette style blinds and fly screens on all windows and skylights. Wi-Fi system, TV with DVD player and high gain telescopic Ariel with a booster to aid reception. 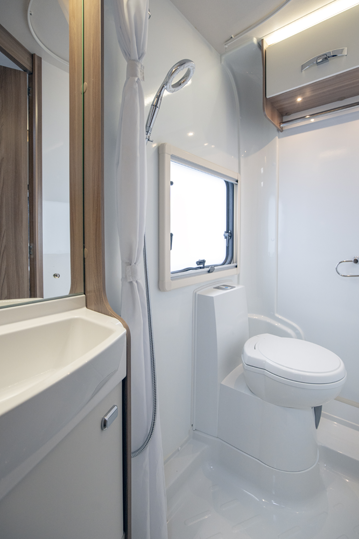 The Escape 664 motorhome boasts a very large washroom which is almost double the size of our other models. Thetford cassette electric flush swivel toilet, overhead towel locker, vanity mirror with storage cupboard, LED downlighters, good sized fixed sink, large shower cubicle, 100 litre internal fresh water tank and 90 litre external waste tank. with tanks heaters for winter use. There is a good-sized double bed in the rear left side, which is fitted with the very comfortable duvalay luxury mattress the bed measures, 1.87m x 1.26m, 6ft 2” x 4ft 2 “, the dining room can also be made up into a double bed measuring 2.09m x 1.23m .... 6ft 10” x 4ft. with memory foam inlaid into the underside of the cushions so when they are turned over makes a very comfortable double bed. The L shaped kitchen in the Escape 664 has a 3-burner gas hob, oven and grill, all with electronic ignition, moulded granite effect sink, fitted microwave, 85 litre fully automatic fridge with freezer compartment, can run on 240 v, gas, and 12 v battery, fold away worktop extension. So, you can cook almost anything that you want in this well-appointed kitchen. Dual fuel heating and hot water system using a trauma combi boiler which runs from gas or 240-volt mains electric when hooked up. The Escape 664 Fitted with a trauma crash sensor so the system can be used whilst travelling, there ae ample USB ports, 12v and 240-volt sockets throughout the van for charging laptops, cameras etc. overhead dimmable ambient lighting throughout backed up with spotlights and LED reading lights in the cab area. There is a new large easy to use LCD digital panel for controlling the vans electrical systems. Fitted with a Thatcham category six tracker, with an app available that can operate the vans systems remotely and to check on levels etc.